For years I have wanted to attend Pubcon, but as a mother leaving town is not always easy. I will be attending this year and I will be totally honest and tell you that I am terrified of flying. I don’t even like looking at planes, yet I am going to fly all the way to Vegas just for Pubcon. 🙂 That is how spectacular it will be this year. I will also be speaking and participating in an interactive site review. So if you are attending please come by and say “hello!”. If you would like to attend and haven’t bought a ticket yet you can save 20% with this code: rc-5514320. There is a lot to learn at Pubcon this year and you will be learning from the best of the best. Check out the large number of sessions available and the fantastic people that will be attending. 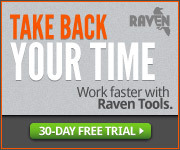 Matt Cutts – of course! I am very excited to see and hang out with all these fabulous and intelligent people. I suggest you attend if you can. There are many great people to meet, business connections to be made and you will walk away with a lot of great information. 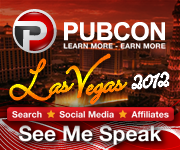 Pubcon 2012 is a must!